These classic earrings are a fan favorite for a reason! 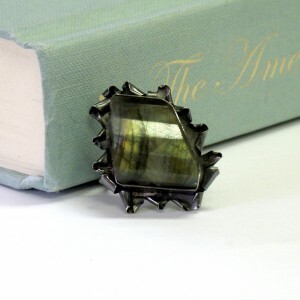 Inspired by the always overcast, misty, stormy weather of the Olympic Peninsula, this understated design highlights two gorgeously glittery, faceted labradorite gemstones. These labradorite stones are so unique, with a speckled, softly glittery texture and flashes of blue and green. 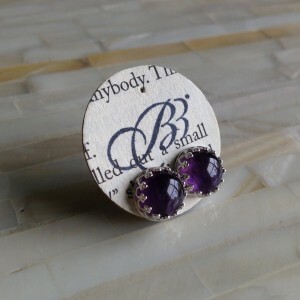 Originally introduced by BellaBejeweled in 2008, I’m so happy to be able to bring them back to you now! The handcrafted, hammered sterling silver earrings are a perfect balance – they’re simple enough for every day wear, or can be dressed up gorgeously. I can almost hear the thunder rolling just looking at these lovelies. Please note that no two labradorites are identical! Labradorite is a unique gemstone, with subtle markings and flashes of color that make each stone an individual. So, in a way, each pair of earrings becomes one of a kind. 🙂 These faceted, marquise cut labradorites are incredibly flashy, so while the markings may be located differently in subtle ways, each pair of earrings is sure to have tons of blue/green flash! Categories: Earrings, Inspirations Collection, Mist Collection. Tags: cloudy, feldspar, forks, gemstone, labradorite, mist, rain, rainy, sterling silver, storms, twilight.